The authors persuasively argue that the present cascade of reforms to public education is a consequence of a larger intention to shrink government. The startling result is that more of public education's assets and resources are moving to the private sector and to the prison industrial complex. Drawing on various forms of evidence-structural, economic, narrative, and youth-generated participatory research-the authors reveal new structures and circuits of dispossession and privilege that amount to a clear failure of present policy. Policymaking is at war with the interests of the vast majority of citizens, and especially with urban youth of color. 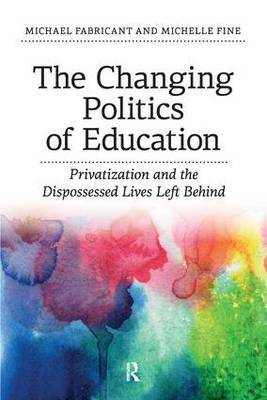 In the final chapter the authors explore democratic principles and offer examples essential to mobilizing, in solidarity with educators, youth, communities, labor, and allied social movements, the kind of power necessary to contest the present direction of public education reform. This is one of those very rare books on public education and social dispossession that bursts the bounds of its brilliant scholarship and explodes into a soaring call for action. Fine and Fabricant carefully dissect the ideological attack upon the public schools, the selling off of public services to the private sector, the marginalization of professional teachers, and the relegation of low-income students to the status of expendables. But the genius of this book lies in its recognition that disinvestment in the public schools and their replacement by selective boutique institutions are serving the purpose for which they were intended: mightily expanding the inequalities of wealth, darkening the futures of the dispossessed, and cannibalizing what remains of democratic spirit in a corporate society. The book ends with strong proposals -- "direct action" and "the reinvention of the work of unions," among other bold suggestions that are seldom heard from academic authors in this era of retrenchment. The book has an electrifying tone. It creates a sense of urgency. I'm profoundly grateful to the authors. This is an extraordinary book. Not only does it address the futility of corporate style education reform but places schooling in the context of world economic and political ideology and practice. More, Fabricant and Fine refuse to stop at critique. The last chapter is a finely honed series of proposals for what genuine change world look like. A must read for parents, teachers and everyone concerned with the fate of our children and our world. In recent years, politicians and the mainstream media have come to equate educational reform with high stakes testing and market mechanisms such as incentives, choice, and competition. The Changing Politics of Education explains why these approaches have risen to prominence and how they undermine learning and constrict educational opportunity. Fabricant and Fine show us the connections between this problematic vision of reform and a broader political and economic agenda that fuels inequality and endangers democracy. This book will be an invaluable tool for scholars, educators, and activists seeking to promote educational and social justice.